Last analysis expected downwards movement to a short term target at 99.75 to 97.96 before the beginning of a fourth wave correction. Price moved lower to reach down to 101.07, 1.32 short of the target, before turning upwards in typically corrective movement. So far to the downside there are only three waves. Minute wave iv must remain out of minute wave i price territory, and a final fifth wave down must unfold to complete minor wave 1. 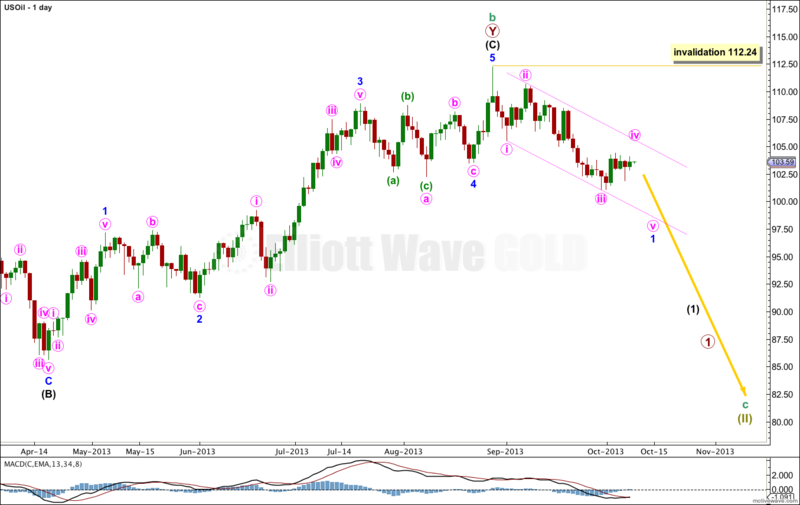 When minor wave 1 is completed I will expect upwards movement for a deep second wave correction. 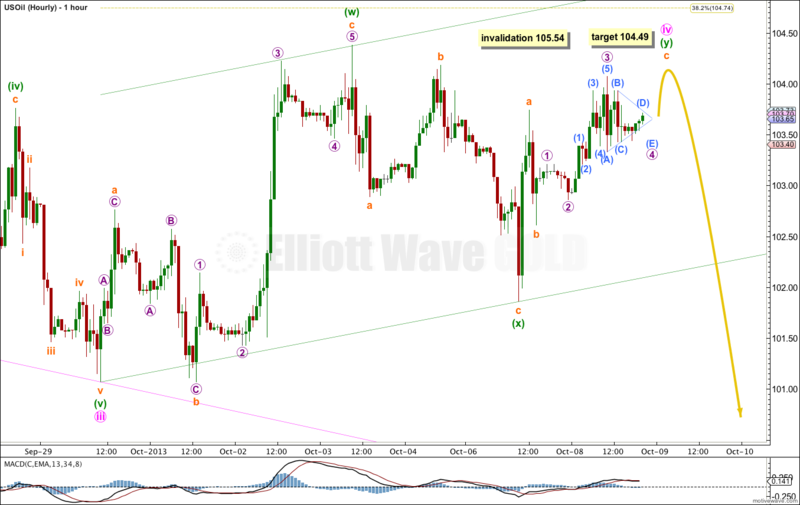 Minute wave ii was a deep 77% double zigzag. Given the guideline of alternation I would expect minute wave iv to be shallow and not a double zigzag. Minute wave iv may be unfolding as a double combination: flat – X – zigzag. This would provide structural alternation with minute wave ii. Minute wave iv may end about the 0.382 Fibonacci ratio of minute wave iii. This would provide alternation in depth of correction. Within the second structure of this combination labeled minuette wave (y), subminuette wave c needs to complete as a five wave impulse. At the time of publication there may be a small fourth wave triangle completing. When this is done I would expect a short sharp upwards thrust to about 104.49 where subminuette wave c would reach equality in length with subminuette wave a. This target would see the structure for minute wave iv move sideways, which is the purpose of combinations. I have drawn a big best fit channel about this correction. When this channel is very clearly breached by downwards movement then I would have confidence that minute wave iv is over and minute wave v should be underway. Lara will there be an update soon. Brent crude at $110 has invalidated the count???? The data I am analysing is not Brent crude, it is WTI , US crude oil. US Oil has not passed 104.38. It moved sideways… and then slightly lower… this wave count remains correct. You are looking at a slightly different market, but they will have different wave counts.